Buy Blue Microphones at great discounts . BLUE microphones are more than just a tool for recording ..... they are an investment in quality, value and expression. You are sure to display them for their artistic beauty, covet and protect them for their investment value, and treasure them for conveying the heart and soul of any musical recording. The Blue Dargonfly is a Class A discrete, transformerless cardioid microphone complete with an integrated elastic shockmount, offering a rotating capsule grill that can be positioned in the most challenging areas. It includes a handcrafted 1" diameter capsule with a 6micron mylar diaphragm covered with a special mixture of aluminum and pure gold. The outcome is a microphone with level frequency response resulting in no coloration, plus a low output impedance, and no side effects from cable capacitance and load impedance. Only the capsule determines the sound. Handcrafted solid-state, class A, discrete condenser mic with a precision-machined, gold-sputtered capsule enclosed in a lollipop spherical grille. Fixed cardioid pattern. Ideal for recording vocals, percussion, or any acoustical instruments. 20Hz-20kHz. 133dB max SPL. The Kiwi, BLUE's top-of-the-line Class A Discrete model, features 9 selectable polar patterns including cardioid, figure-8, omni, and selections in between. This is achieved in a careful, unique manner using Blue's double-backplate capsule. 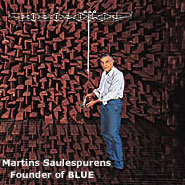 This unique capsule is measured in an anechoic chamber to ensure optimum performance. The capsule assembly is mounted to the body with a mold-injected rubber stem to help isolate unwanted rumble. This microphone provides enough options to satisfy the needs of even the most critical recordist! With detailed information in the midrange area and a soft silky response in the top end, the Cactus details and mellows the program material. The amplifier design is based on a single vacuum tube sub-miniature. Multipattern. 20Hz - 20kHz frequency range. Includes power supply, ATA flight case, series one shockmount/pop filter, and Kiwi cord. Includes power supply, ATA flight case, series one shockmount/pop filter, and Kiwi cord. Designed to deliver the same high-quality audio that Blue users have come to expect. Boasting a unique look and highly versatile performance, this pressure gradient cardioid utilizes Blue's renowned microphone technology and a Class-A discrete amplifier circuit. It can be used in any number of applications, from vocals to guitars, close-miking of drums or drum overheads, percussion, piano, horns, strings, or anywhere else where crystal-clear sound is the top concern. The amplifier consists of top-grade components such as polystyrene capacitors, metal film resistors, and hand-wound output transformers. The single-pattern capsule is hand built. Its rotating grille allows the Mouse to be positioned in the tightest of areas. The capsule is shockmounted in both the grille assembly and within the rotating grille armature to eliminate all outside low-end interference. Elegance and simplicity are the driving forces behind Blue's design philosophy, and ROBBIE is no exception. This Class-A discrete tube microphone and instrument preamp features the same technical build quality and commitment to excellence for which Blue is known. Yields excellent detail with extremely low noise and ultrahigh gain. The warm, robust tube gain stage is the perfect enhancement for condenser microphones. Frequency response is 10Hz to 100kHz, 2dB. 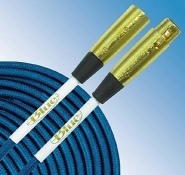 The Blueberry mic cable is a 2-conductor, 22-AWG cable using only B.L.U.E. 's virgin proprietary materials. Twisted-pair construction eliminates any noise caused by electromagnetic interference emanating from equipment used in the studio or stage environments. Furthermore, the tinned-copper 95% braided shield makes this cable a dream to handle in any temperature where microphonic pickup might come into play. When it comes to maximum frequency response, this is definitely a fruit of a different color! Capture the Heart of What's in Your Head . . .
BLUE stands for Baltic Latvian Universal Electronics and for the ultimate in quality! Our work speaks for itself. You'll find BLUE microphones are beyond compare as a valuable investment and unsurpassed as a musical production tool. BLUE has its own facility located in Latvia (one of the Baltic states, located outside Russia). At BLUE, we are not interested in cost-effective mass production, which could jeopardize the design quality of our tube and solid state microphones and related products. We design and manufacture all capsules the heart of the microphone as well as precision parts, from the smallest screw to the large body shells used for our Bottle microphones. We've researched the needs of engineers and musicians alike, to create an exceptional collection of microphones. What makes BLUE microphones so unique, and so valuable? Our unique formula. The mylar film of our BLUE hand-built capsules are sputtered with a special, unique-to-BLUE formula of 24-carat gold of absolute pure (99.99%) quality and aluminum. This special film is tensioned to our own hand-built brass backplates, designed and manufactured in our Riga factory. Our formula allows us to achieve the fastest transient response without the sacrifice of low-end frequencies. BLUE considers the capsule to be the heart of the microphone. This most important element is manufactured solely by us and not sourced from another company. This process is crucial to achieving the unique sound quality that is the trademark of a BLUE microphone. BLUE builds and tunes each capsule by hand. The finished capsules are measured in our anechoic chamber for the optimum performance. Each microphone capsule is mounted with our molded, injected rubber stem, to isolate unwanted rumble. Our optional elastic shockmounts eliminate outside infrasonic interference. ..."as if someone is singing right next to your ear." No integrated circuits. Our solid state and tube microphone amplifiers are based on a Class A, fully discrete circuit, employing a custom microphone transformer built and wound to BLUE specifications. This enables our hand-built microphone capsules to be fully realized in their performance. When our mics are used with BLUE's high-definition mic cables, the sound has extreme presence . . . "as if someone is singing right next to your ear." Strict electronic and construction tolerances. Insured by the use of high-end quality components, these tolerances guarantee unsurpassed reliability and low noise. All our microphones handle loud sound pressure levels (SPL) and still capture the crucial dynamics that make recordings stand out. Our extensive research. We studied the frequency curves from scores of vintage, tube, and solid state microphones, from which we determined the most desirable sound qualities. The sonic design of our microphones was created by what we term TPO, or The Popular Opinion . . . the consensus of expert engineers and discriminating musicians on the type of sound that is needed in the recording process today.